I’ve lived in El Médano for around five years – not all at the same time, but when I put all the bits together that’s what it amounts to. Not the longest I’ve lived anywhere (in bits or no) but thinking about it now, at the beginning of this shiny, new year, it’s the only place I’ve actually ever chosen to live…..every time – I came here because it was where I wanted to be, not because it was handy for work, or schools or the property was cheaper, but simply because I fancied living here (well, it may not exactly have been first choice,but most affordble and so it will do). Reasons for moving away have been varied, and, because I’m odd that way, I’ve never missed it that much either, but the place does have a pull I can’t quite put my finger on……….or can I? No less than 3 times in the last week interesting stories about this wee town have come my way, and although 2 of the 3 are myths, you have to recognize that this is a town which revels in the weird and the offbeat, even those good old boys watching the sunset down on Playa Chica (one of whom asked me out for breakfast the other evening) like to think this is a town apart, and it surely is. A few years back I read that the worst thing anyone had ever said about…..wait for it…..George Bush …..now isn’t your mind racing to guess the answer??? ?…… was that he was incurious. Won’t go there, of course (we don’t have all day, do we, and it’s all history already) but giving the comment some thought I absolutely understood it, and I deserve a kick in the pants for not being more curious about the odd and yet familiar structures which dot El Médano’s beaches. They are familiar, basically, because I’m a BabyBoomer, a first wave BabyBoomer at that, some of my earliest memories involve leftovers of World War 2; my father’s RAF uniform hanging in the wardrobe, ration books, the eerie ruins of bombed buildings in Liverpool, and – bunkers. I lived very close to an airfield, and although it must have been of minor importance, there were bunkers hidden amongst the hillocks surrounding it. They were things of mystery – grown-ups were then reluctant to talk much about the goings-on of recent history – but in typical childhood fashion our imaginations were soon distracted by other things, horses which moved into a field opposite, the newly-available (when sugar ceased to be rationed) candy in the corner shop and, of course, television. And so bunkers became just a part of the landscape. 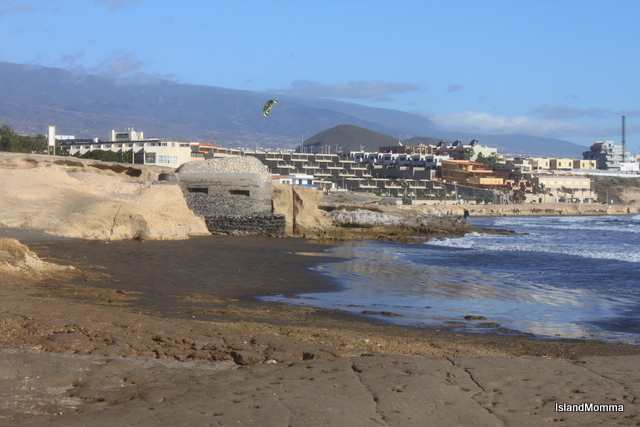 I guess this was why, when I first saw bunkers on the beach at El Médano I didn’t see them as anything out-of-the-ordinary, until I realized that Spain had avoided involvement in World War 2, since it was recovering from a devastating civil war. So why were there bunkers on this beach? 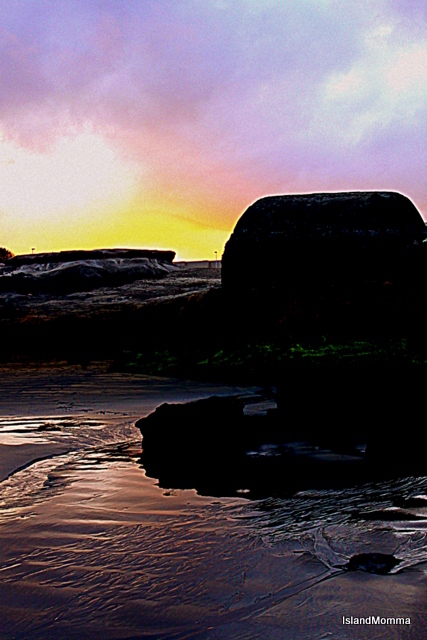 This bunker sits very close to the ocean on the rocky beach at Playa Cabezo. 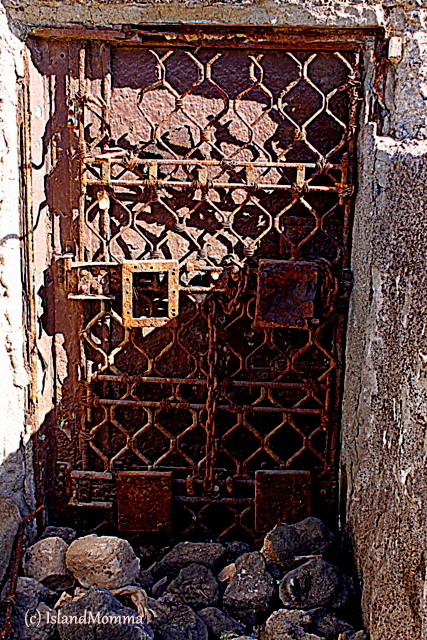 The photo above is a detail from the doorway. We know that Franco was pro-Hitler, or at least that he owed Germany a debt, since the Luftwaffe had been an important ally, not only in dropping bombs (most famously Guernica of course) but also in providing transport for Franco’s initial leap from North Africa to the Spanish mainland, yet he managed to walk a tightrope from 1939 to 1945, declaring Spain at first non-beligerant and eventually neutral. It seems that relations between the two dictators weren’t as pally as we might assume, each making demands of the other which were unacceptable, perhaps because they were both really doing a balancing act, and had more interest in maintaining the status quo between the two countries. Reportedly one of Franco’s demands was German aid to fortify the Canary Islands. In fact, it seems that Hitler, one stage, at had plans to invade both the Canary Islands and the Azores, the strategic positioning of each achipelago being obvious, but was disuaded by his navy who thought the stretching of supply lines to maintain the islands was too much, but in the war’s early years the German navy did visit Canarian ports. 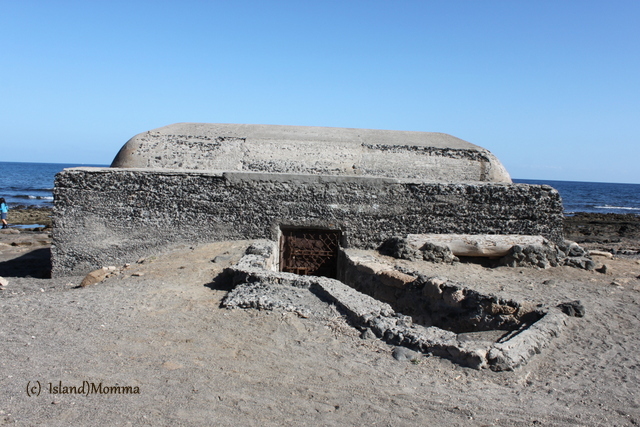 It was, then, logical to assume a potential invasion by Allied Forces, and bunkers were constructed throughout the islands, although I have the impression that the ones in El Médano remain in better condition than those found elsewhere. I stand to be corrected there. Historic marker on the flank of Bocinegro depicting just what it is you’re looking at. It wasn’t the first time Tenerife had girded its loins against possible threat from Britain’s navy. There had been the most famous attempt at the Battle of Santa Cruz in 1797, where Lord Nelson suffered the only real defeat of his career and lost his arm in the process. Historians dispute whether that was really an attempt at invasion or a distraction, but Santa Cruz’s fortifications stood the test. More than a hundred years before that, in 1657 the “father of the British Navy” Robert Blake had destroyed 16 ships at Santa Cruz during the Anglo-Spanish War, which, ironically, followed close on the heels of Britain’s own Civil War; and the first Battle of Santa Cruz in 1706 had suffered a similar fate to the later one. This is the bunker on the side of Bocinegro, the smaller of the two, volcanic cones which protrude into the Atlantic on the edge of the bay. This is the view from atop the bunker. It is, as you can see, really well camouflaged, covering in stone from the surrounding area. In fact, Britain had drawn up invasion plans code named Operation Puma, which were, allegedly, to be put into operation should Spain (or presumably Germany) invade Gibraltar. Germany, in turn, had plans to invade Gibraltar, code-named Operation Felix, which were shelved in 1941 due to lack of support from Spain. And thus it was, that despite drawing up of plans, strategic dithering by Franco and President Roosevelt’s concerns that possible U-boat refuelling in the islands might make the islands a “springboard” for Atlantic agression, the bunkers were never, really needed. Today they provide some interesting photo ops at sunrise, and act as windbreaks for sunbathers and a reminder of what might have been, as Spanish, English, Germans and Italians all play and mingle happily on El Médano’s beaches. 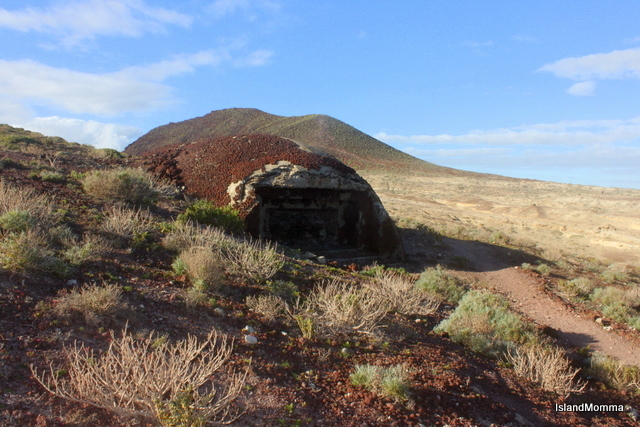 Categories: Canary Islands | Tags: Él Médano, bunkers on the beach, canary islands, canary islands and ww2, relics of ww2, tenerife, ww2 bunkers | Permalink. Well, I didn’t know about the bunkers, Linda. Fascinating history! It’s the funny thing, that you take them for granted. I suppose I’d seen so many in Britain they didn’t register as something out of the ordinary, and I suppose the young locals have just grown up with them there, so never give them a thought. A wonderful reminder of how we should remain curious even about what might be found in areas we think we know so well. This really is such interesting history you uncovered and I love the photos you have to illustrate it. Your last sentence is quite powerful with the image of all mingling happily on the beach, not thinking about the events of the past. Great job! Been interested in these bunkers for a while now but have not had the opportunity to do the necessary research on them. Your effort is much appreciated. I’m very glad you enjoyed it. I’d like to find out more, actually. Although they never do seem to have been necessary! If I find out more I’ll let you know! Many thanks for both reading my ramblings and for taking the time to comment. Thanks Cathy. I couldn’t agree more about being curious. I once wrote a post about it, but couldn’t find it! The last, few year have been rather lean (expected pension did not materialize), and when I realized that they were going to be so I decided to look around me as if I’d just landed to compensate for lack of actual travel, but I think over time that waned a little………. Revitalzied now for the new year – or perhaps just the thrill of anticpating travel again in a few months! Yep. I think one thing about being older is realizing the futility of war when we see that in some ways it might never have happened. It’s the same when we read stories from Vietnam, isn’t it. WW2 nevertheless is a part of history for me, though I was born scarcely a year after its end, but Vietnam was a part of my youth and growing up, and it seems incredible that so many folk are flocking there now. Let’s just hope we will be saying the same about Afghanistan and Iraq in our lifetimes! fascinating history Linda. I’d no idea of the role this island played in WW2. And am hoping to visit your island to see some of its glories for myself one day! Well, it turned out to be more of a non-role in the end. I did more research than a blog post merits to be honest, and came across a document online which is some sort of offical note (spy stuff!) which says that the population overall was sympathetic to the Allies (or the UK) but that they were unlikely to act on it. Interesting stuff. Hope you make it soon!!! as someonen who shared those playtimes on the what I now know was machair with harebells and giant puff balls and horses roaming. the pill boxes were indeed part of the landscape. only today I found myself walking past the cobbled walls of what was Arnold School starting to wonder about the history of them. having walked by them hundreds of times and never given that a thiought. I always thought I had an enquiring mind and then something makes me realise ‘getting sloppy’. But the nice thing is that we now have information at our fingertips which would have taken hours and financial outlay to acquire even just a few years back! After just spending a week in El Medino I too have taken a fondness to it, indeed I also felt fascinated by the bunkers? However I think it was the first time I had ever been so close to one? All of them different. Someone has taken refuge and turned it into there home by the Grand hotel! I couldn’t figure out why they would all need to be there? After reading on the red mountain about being WWII bunkers? Now you have answered my question. Thank you. You’re right. They are all different, no standard plan to them at all. Yep some of them have been utilized over the years, and now and then there are protests about that. I suppose that they are a loose part of history, but since they were never needed, I’m not sure really how important they are. As a reminder of history I guess they are significant, because we should never forget the lessons of history, of course. Thank you very much for reading, and for commenting. I hope you had a great holiday in El Médano. The weather wasn’t perfect of late, though better than in UK I think! Are you a windsurfer? I was told that there are old photos somewhere showing WW2 German officers taking time out in El Medano, might be worth looking into. That wouldn’t surprise me, though El Médano seems to be less popular with Germans than other parts of the island. I’ve heard all sorts of rumors over the years, but I think most were just that, rumors. Thank you very much for reading and commenting, it’s appreciated. I was told by a local that this was a U boat refuelling re arming base and the flat bit of ground between the road and the rock wher a little biege square building stands was a german air strip. The water just west of the rock is a good deep mooring for ships so could well be true. Interesting. Certainly U boats were in Gran Canaria, and I’d been given to understand that the piece of land had been an airstrip, yet, it really doesn’t seem long enough, does it? Indeed the water is deep. You have, no doubt, seen the tankers supplying the airport moored there regularly. There are loads of Nazi-connection rumors and stories around the islands, though, and whilst I am sure there was some truth in some of them at one time, i am also sure that they have become embellished in the telling. 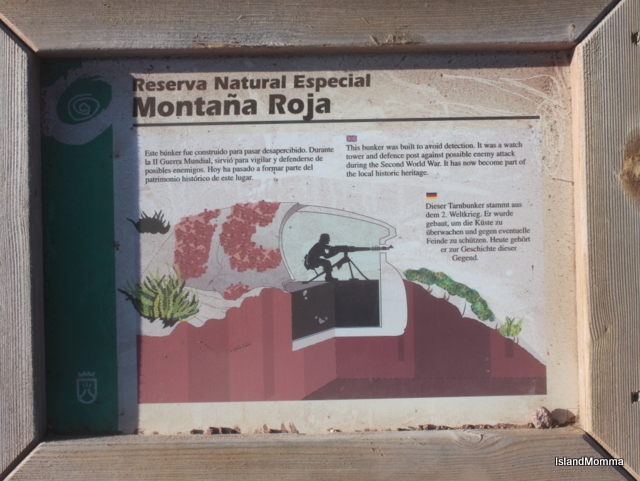 I heard one here, in Fuerteventura, which seems to have been reasonably well documented online at one time, but almost all references have been removed, which, in itself is interesting. That said, could have been removed because untrue, or could have been removed to protect people? How old was the local with whom you spoke? There cannot be many folk left now who remember those times. My dad was 18 when he joined up during WW2 and he’s 90 now, and not many people live to his age. Hi I’ve just come back from Fuertaventura where we visited the Villa Winter. Very mysterious potential links to the Nazis. Have you been? Hi, Jess. 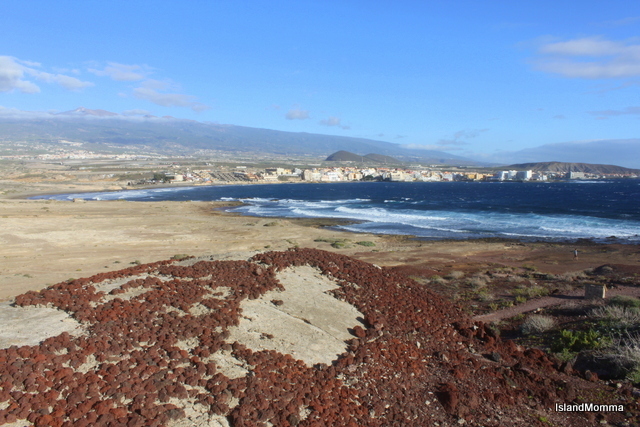 I was in Fuerteventura in Spring of last year, but I didn’t realize that Villa Winter could be viewed. I heard lots of stories, including one from a young man in the telephone business, who’d worked on the house, and said that the technical stuff they had there from the 40s was way more advanced than the average person would have had. I tried to research it a bit after I left, but although there were links on the internet, they were all dead, which made it even more mysterious! Since then I haven’t really followed it up though.